New York Times-bestselling author Megan Whalen Turner’s entrancing and award-winning Queen’s Thief novels bring to life the world of the epics and feature one of the most charismatic and incorrigible characters of fiction, Eugenides the thief. Megan Whalen Turner’s Queen’s Thief novels are rich with political machinations and intrigue, battles lost and won, dangerous journeys, divine intervention, power, passion, revenge, and deception. 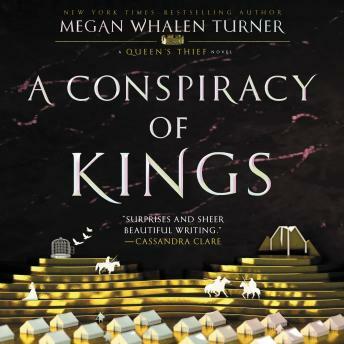 The New York Times bestseller A Conspiracy of Kings won the Los Angeles Times Book Award and is perfect for fans of Leigh Bardugo, Marie Lu, Patrick Rothfuss, and George R. R. Martin. After an attempted assassination and kidnapping, Sophos, heir to the throne of Sounis, disappears. Those who care for him—including the thief Eugenides and the Queen of Eddis—are left to wonder if he is alive and if they will ever see him again. The Queen’s Thief novels have been praised by writers, critics, reviewers, and fans and have been honored with glowing reviews, “best of” citations, and numerous awards, including the Los Angeles Times Book Prize, a Newbery Honor, the Andre Norton Award shortlist, and the Mythopoeic Fantasy Award. Discover and rediscover the stand-alone companions, The Queen of Attolia, The King of Attolia, A Conspiracy of Kings, and Thick as Thieves, all epic novels set in the world of the Queen’s Thief.